To the lamenting land I call! Then the home shall undress the dark attires that feeds the eye of strangers. Olaseni Kehinde Precious with the sobriquet "Pen Kenny" is a native of Akure, Ondo State, Nigeria. She's an undergraduate of English and Literary Studies at the great citadel of learning; Obafemi Awolowo University, Ile-Ife, Osun State, Nigeria. 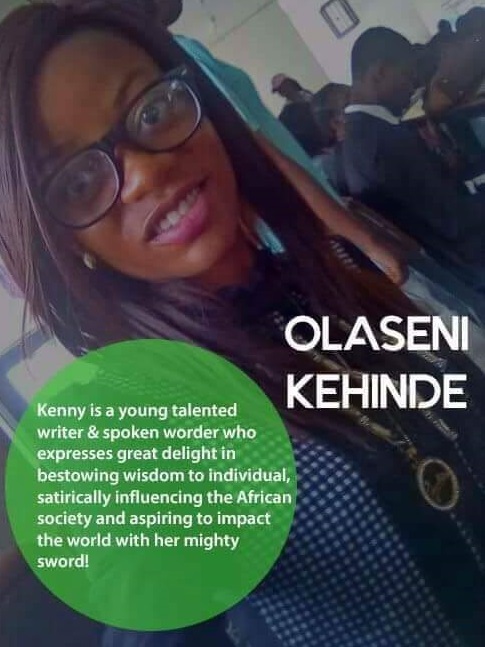 She's a member of the Association of Nigerian Authors, Osun State branch where she learns to play with literary alphabets and shape the society with her mighty sword.